Boxart for both versions of the game. 大乱闘スマッシュブラザーズ for Nintendo 3DS and Wii U? 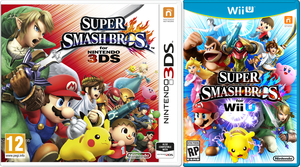 This article or section is a short summary on Super Smash Bros. for Nintendo 3DS and Wii U.
Super Smash Bros. for Nintendo 3DS and Wii U (大乱闘スマッシュブラザーズ for Nintendo 3DS and Wii U? ), also collectively and unofficially referred to as Super Smash Bros. 4, are the 4th games in the Super Smash Bros. series, as both games are essentially the same with some minor differences. Several Pikmin-related elements return from Brawl, such as Olimar being a playable character, and the Distant Planet stage being on the 3DS version of the game. At the same time, many new elements from the Pikmin series also make a debut. Official artwork of Olimar from the Super Smash Bros. for Nintendo 3DS and Wii U website. Captain Olimar returns as a veteran fighter, retaining much of the moveset and characteristics he had in Super Smash Bros. Brawl, despite being lighter in this installment. Most of his attacks involve using his Pikmin, which are killable, and if none are nearby, those same attacks will fail. Different Pikmin have different properties. The major difference between this game and Brawl is that here, Olimar may only have 3 Pikmin with him at a time, and they are plucked in order. Olimar keeps many of his standard moves from the previous game. Like every veteran, many moves have gone through a slight adjustment. Pikmin Pluck: Olimar plucks a Pikmin. However, as stated, he can only keep three Pikmin, and to make the Pikmin use more strategy-based, the Pikmin come in a set order (Red, Yellow, Blue, White, Purple, repeat). 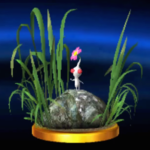 The Pikmin that is next in line to be thrown has a pointer above its head. In the 3DS version, all Pikmin stay in their leaf stage and cannot develop buds or flowers. Pikmin Throw: He throws Pikmin, which will latch on and attack, excluding Purple Pikmin, which will just knock the victim back. In general, Pikmin are thrown further than they were in Brawl. In the Wii U version, Pikmin may also carry small items back if thrown at one, such as Pitfalls and Capsules. Winged Pikmin: Two Winged Pikmin appear and lift Olimar and his Pikmin up. Opposite to his recovery move in Brawl, Pikmin Chain, the more Pikmin he currently has, the worse his recovery is. Olimar's Final Smash in Super Smash Bros. for Wii U.
Pikmin Order: Just like in Brawl, all wayward Pikmin are whistled back. There are far fewer super armor frames than there were in Brawl. Olimar maintains the same Final Smash, End of Day, from his appearance in Super Smash Bros. Brawl. However, the ship now plummets downward to the stage instead of falling upright. It has a larger blast radius as well. Finally, the player can also adjust where Olimar lands. Olimar and Alph as seen on Pic of the Day. Each Pikmin type has some special properties that, for the most part, reflect the Pikmin in the main series. Olimar can use the Pikmin has a melee weapon, as is the case with most of his standard attacks, to grab, pummel, and throw enemies, or he can throw the Pikmin so that they latch on and strike repeatedly. Red Pikmin: All damage caused with Red Pikmin is slightly higher than normal. They also have a fire effect to them, which can instantly thaw frozen opponents, and are also completely impervious to any attack that has fire properties. Yellow Pikmin: All damage caused also has an electrical damage effect, and when thrown, they are thrown in a higher arc. They are completely immune to attacks with electrical properties. Blue Pikmin: These Pikmin will not be killed if they go in water. To compensate for having no combat-related advantages, they throw opponents farther than other Pikmin when used with a grab command. White Pikmin: Pummel and latch damage caused create clouds of purple gas, which are only aesthetic and reflect White Pikmin's poison abilities, but cause a lot of damage. They are also quicker than other Pikmin, and when thrown, go quite far, which is an attribute not seen in the canon games. Purple Pikmin: When thrown, they do not go very far and do not latch on to enemies, but instead knock them back. This could be a reference to how a Purple Pikmin's "main" form of attack is to land on enemies with a thud, and only then attacking. Although they cause good damage and knockback, they are the slowest of all Pikmin types. Alph was first leaked by a leaker a week prior to the 3DS version's release in Japan. At the time, it was not known if Alph was a new character or an alternate costume. A few days later, on September 11th, 2014, Masahiro Sakurai confirmed that Alph was an alternate costume for Olimar. He functions exactly the same as Olimar, even when it comes to the stage introduction and Final Smash. He, like Olimar, is unable to use Rock Pikmin. Alph's model is slightly scaled-up, making him slightly larger than he was in Pikmin 3 in order to match Olimar's proportions, so that the two costume choices wouldn't impact gameplay. 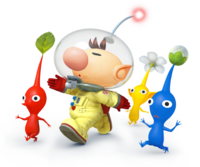 Olimar's alternate costumes, including Alph. Olimar retains his red spacesuit from Brawl. His green color has gone through changes, as well has his white one. Alph has pink and green suits based off of Charlie and Brittany, respectively. He also has a red suit that resembles Olimar's. Like the other characters in the game, Olimar comes with 2 alternate moves for each of his special attacks, as well as exclusive equipment. For the latter, he can exclusively equip "Pikmin" (attack) and "Space Suit" (defense) equipment, and can also equip "Boots", which boosts speed. Alph and Olimar's aliases in the Boxing Ring. In the Boxing Ring stage, Olimar's alias is "Veteran Astronaut", and Alph's is "Astronaut in Training" in the US version, and "Novice Explorer, Engineering Pro" in the European version. Palutena's Guidance conversation regarding Olimar. This article or section is a short summary on the Garden of Hope arena. A stage based on the eponymous Garden of Hope is available from the start in Super Smash Bros. for Wii U. For the most part, the layout is identical to that of the Pikmin 3 area, with some changes to make it more akin to a Super Smash Bros. battle arena. One of the key hazards in the area is the Peckish Aristocrab. It scuttles around, knocking down the fragmented teacup and climbing sticks, and knocking back fighters who touch it. Wild Pikmin can fix the damage caused by the crab. Fighters can destroy the teacup, the climbing stick and the bridge. Two elevator platforms also exist. The Garden of Hope stage. The Peckish Aristocrab, along with wild Pikmin building a climbing stick. This article or section is a short summary on the Distant Planet arena. The Distant Planet stage is present as a Brawl stage in the 3DS version. As a whole, not much has changed from Brawl, aside from some minor changes in the background. Just like in Brawl, the stage seems based off of The Forest of Hope and the Awakening Wood. The Omega form of this stage takes away all the vegetation and leaves a simple dirt platform to fight on. This form also provides a better view of the background. The standard form of the stage. The Hocotate Bomb item, with Olimar and Sonic looking at it. This article or section is a short summary on the Hocotate Bomb item. The Hocotate Bomb is a new item in both versions of the game. It looks like the Hocotate ship, and when triggered, it flies up in the air, then crashes back down much like the Warp Star item. However, it should be noted that the bomb will crash down abruptly, giving no indication of when it will drop. The explosion it causes is quite big, and could result in a KO if it hits an opponent. The Hocotate ship is still used for Olimar's Final Smash, End of Day. The Red Bulborb on a floating platform in Smash Run. This article or section is a short summary on Smash Run. Two enemies from the Pikmin series appear in the 3DS-exclusive mode, Smash Run. The Red Bulborb appears as an enemy in Smash Run. It is a strong enemy that attacks by charging and biting. It seems to be based off of its Pikmin 2 design, having purple eyes instead of blue, and smoother skin. The Bulborb's attacks have strong knockback and cause considerable damage, making them a formidable foe; arguably one of the hardest. It has a simple charging attack, a biting attack, and even a backwards jumping attack to attack players behind it. It is a semi-rare enemy to find. The Iridescent Glint Beetle in Smash Run. The Iridescent Glint Beetle is one of the rarest enemies in Smash Run, only appearing in small caves that are normally out of the way. It will only reveal itself after the player walks over its hiding place. Once it pops out, hitting it will cause it to release golden coin bags. This article or section is a short summary on Smash Tour. In the Wii U-exclusive mode Smash Tour, the Yellow Wollywog and Plasm Wraith appear as usable trophies. The Yellow Wollywog trophy nullifies any trap that the user steps on on the board, and the Plasm Wraith trophy will heal the player if they block attacks using a shield, in-battle. An Iridescent Glint Beetle will also occasionally appear on the board, and will drop extra fighters if a player bumps into it. Usually, two of these appear at once. Plasm Wraith trophy in Smash Tour. Yellow Wollywog trophy in Smash Tour. The Iridescent Glint Beetle in Smash Tour. This article or section is a short summary on the Pikmin-related trophies. Trophies are a key part of the Super Smash Bros. franchise, and there are quite a few Pikmin trophies. A good amount of trophies from the Pikmin franchise are present in the 3DS version, but not nearly as many as the number of trophies in Brawl. They are listed below. Since the Wii U version featured many more trophies from console games, there are many more Pikmin trophies in this version. “Alph is a young explorer who crashed on the planet PNF-404. As the engineer of the S.S. Drake, he feels responsible for finding the missing crew and the ship after the crash. Waking up in a pond, Alph quickly encounters a tiny creature—it's a Pikmin! “This Pikmin has a red body and a long, pointy nose. It was the first type of Pikmin Olimar ever met. In Smash Bros., they have the second highest attack power among the Pikmin. Like their fiery color suggests, they can attack with flames and withstand them. “Telling Red Pikmin apart from the other Pikmin is easy: these ones have long, pointy noses. Also, they're red. They're the very first kind of Pikmin Olimar finds on their planet, and their high attack power makes them very useful. In this game, they can deal powerful attacks, and they're very resistant to fire damage. “These pink Pikmin have big, blue eyes and nice wings to help them fly. In Smash Bros., they show up to carry Olimar and friends through the air. However, how high and far they can fly is affected by how many friends they have to carry. More Pikmin will weigh them down. “This particular type of Pikmin has a pink body, blue eyes and...wings? Yep, they can fly, and in this game, they can even give Olimar a lift. The only thing is they'll get tired very easily, especially if they're carrying lots of other Pikmin at the same time. Go easy on them, OK? “These creatures from the Pikmin series have snaillike protruding eyes, huge mouths, and really bad tempers. Despite their cute appearance, they'll happily gobble up Pikmin! In Smash Bros., they appear on the Garden of Hope stage, wandering around or chasing the poor Pikmin. Thankfully, they don't seem interested in the fighters duking it out. “With their spotted backs and big round eyes, Bulborbs are almost cute. But don't be fooled! They have a voracious appetite, and will gladly eat as many Pikmin as they can get their tongues on. In this game, you might spot one in the Garden of Hope stage, getting in the Pikmin's way. Luckily, the Bulborbs won't bother you. Phew! “Brittany is part of the crew that crash-lands on PNF-404. She calls for help using her KopPad, and when Alph finally reaches her, he's got a bunch of Pikmin with him. Brittany doesn't let her deep fascination with these creatures distract her from giving Alph orders. “Brittany is part of the crew that crash-lands on PNF-404. She calls for help using her KopPad, and when Alph finally reaches her, he's got a bunch of Pikmin with him. The biologist in her is deeply fascinated with these creatures, but unfortunately for Alph, that fascination isn't enough to keep her from bossing him around. “A crystallized nectar that contains the essence of the Pikmin's home world, these pellets are most often harvested from the plant life of the planet. Each pellet displays a number on its surface, and this number may increase over time. The Onion generates more Pikmin with bigger numbers. “The crystallised essence of the Pikmin's home planet. You'll need these things if you want more Pikmin, so harvest them by attacking the Pellet Posy they come from. By the way, keep an eye on the number on the front – it goes up little by little, and the higher it goes, the more items you'll get when you lob the pellet at an Onion! “Louie was one of the main characters from Hocotate in Pikmin 2. In Pikmin 3, he's got a super appetite, to say the least. Alph and crew saved him from a swarm of Scornets, only for him to run off with all their food the very next day! It seems like someone should think a little less about food, and a little more about apologising. “A gigantic creature that appears in Pikmin 3. It's so large that it has often been mistaken for a forest. It's pretty docile until its crystal head is attacked, at which point it goes on a rampage! It'll lose its balance if the hooves are attacked. Be careful though—it likes to slurp up Pikmin with its tongue. “Making its debut in Pikmin 3, this creature is so large that it's almost like a walking forest. It's pretty docile until its crystal head is attacked, at which point it goes on a rampage! Damaging its hooves can throw it off-balance, leaving it open to attack. Just remember to stay well away from its Pikmin-slurping tongue! “A mysterious life-form in the Formidable Oak, the final area of Pikmin 3. Formed from a gelatinous substance, it normally can't be damaged at all...but with Olimar newly rescued, maybe he holds the key. When it takes humanoid form, it unleashes some terrifying attacks! You'll need all your skills to take it down and finish the game! “A mysterious life form in the Formidable Oak, the final area of Pikmin 3. Formed from a gelatinous substance, it normally can't be damaged at all...but maybe the newly rescued Olimar holds the key. When it takes humanoid form, it unleashes some terrifying attacks. You'll need all your skills to take it down and finish the game! There are 3 Trophy Boxes for the Pikmin series. One is "Space Explorers", which holds all main characters from the Pikmin series, and their spaceships. It also holds the Hocotate Bomb, although it technically isn't a ship. Another is "Pikmin", which showcases the known species of Pikmin. The last is "Distant Planet & Indigenous Creatures" (US) / "Pikmin Enemies" (Europe), which holds all enemy trophies, excluding the Iridescent Glint Beetle. The End of Day trophy is in the Trophy Box titled "Final Smashes 3". The Iridescent Glint Beetle and the pellets do not have a trophy box. The completed "Pikmin" Trophy Box. The completed "Distant Planet & Indigenous Creatures" Trophy Box. The completed "Space Explorers" Trophy Box. This article or section is a short summary on the Pikmin-related songs. Main Theme (Pikmin) Yes Yes Original from Pikmin Starter The theme that plays on the title screen in Pikmin. Forest of Hope No Yes Original from Pikmin Unlockable The theme that plays on The Forest of Hope. Plays the standard version first, and then the combat variant. Stage Clear / Title (Pikmin) No Yes Remix created for Brawl Starter A remix with the sunset fanfare and the title screen in Pikmin. Environmental Noises No Yes Created for Brawl Starter Generic wild-life noises, based on the background wildlife sounds heard in Pikmin 2s overworld areas. World Map (Pikmin 2) No Yes Remix created for Brawl Starter A remix of the theme that plays on the area selection menu in Pikmin and Pikmin 2. Stage Select (Pikmin 2) Yes Yes Remix created for Smash 4 Starter A remix of the theme that plays on the area selection menu in Pikmin 2. Garden of Hope No Yes Original from Pikmin 3 Starter The theme that plays on the Garden of Hope. Mission Mode (Pikmin 3) No Yes Remix created for Smash 4 Unlockable A remix of the theme that plays in most Mission Mode stages. Like all other Smash fighters in this installment, Olimar has an amiibo of himself as a fighter. The amiibo has Olimar and one Pikmin of each of the three primary types, and in this game, it serves as a figure player, like all other fighter amiibo. However, Olimar's amiibo can be used in a few other games as well to unlock certain content. For instance, in Mario Kart 8, using the amiibo unlocks a spacesuit outfit styled like Captain Olimar's. The logo for both versions. Boxart for the Wii U version. Olimar's character slate from the Super Smash Bros. for Nintendo 3DS and Wii U Direct. The Pikmin being compared to Kirby's size. A Red, a Yellow and a White Pikmin. Olimar and Bowser on the elevator platforms. Olimar on the Smashville stage. Olimar attacking Pit and Link. Marth and Mega Man in the Garden of Hope stage. Yoshi looking like he is eating a Yellow Pikmin. Marth slashes his sword at Olimar. A closeup of the elevator platforms. An image showing the extra details added to Olimar in Super Smash Bros. for Wii U. A closeup picture of a White, a Red, and a Purple Pikmin next to Mega Man. Olimar and the Wii Fit Trainer taunting. Olimar standing in front of Giga Mac. Alph and Olimar on the character selection screen. Boxart for the Nintendo 3DS version. Olimar in the 3DS version of the game. The leak that hinted at Alph being in the game. Oddly, the Mission Mode remix theme has "(Pikmin 3)" in the title, in order to disambiguate the game the song belongs to. This is pointless, however, as only Pikmin 3 has a Mission Mode – the previous games have a mode called Challenge Mode. The trophy descriptions have a small number of errors in them. A list of such mistakes can be found here. Unlike most characters, Olimar's animations are slightly different between Super Smash Bros. for Nintendo 3DS and Super Smash Bros. for Wii U. 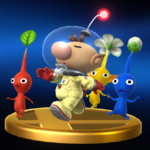 The light on Olimar's head obeys its own bobbing physics in the Wii U version, while it remains fully static in Super Smash Bros. for Nintendo 3DS. This page was last edited on January 16, 2019, at 03:35.